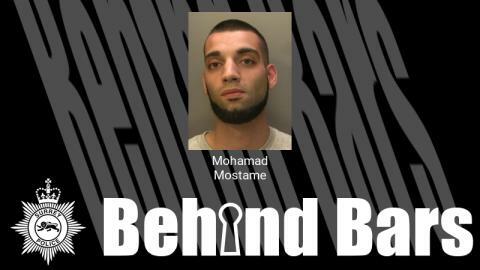 24-year-old Mohamad Mostame, of Marlow Crescent, Twickenham, was sentenced to five years and nine months in prison at Guildford Crown Court after being found guilty of possession with intent to supply class A drugs. He was arrested in the early hours of 21 November 2018 in Deepdene Avenue in Dorking after officers discovered over £5,000 worth of cocaine hidden in his sock, along with a cutting agent in the glove box of the car in which he was travelling. Two 17-year-old girls were with Mostame when he was arrested. Concerns were raised over potential trafficking offences and both girls have been safeguarded with help from specially trained officers on the child sexual exploitation team. Investigating officer PC Lee Munday from the proactive drugs team said: “Surrey Police has a specialist team set up to tackle county drugs lines which tackle drug dealers just like Mostame. "Mostame was part of a county drugs line which operated across Surrey and Sussex. "On this occasion Mostame was stopped as a passenger in a car with over £5,000 of cocaine in his sock. A search of the car revealed a significant amount of drugs and a cutting agent in the glove box which we were able to link to Mostame through forensics. It is highly likely that these drugs were going to be transported to a location to be further cut up and sold on. If you are concerned about drug use or drug dealing in your area, contact us on 101 or Crimestoppers anonymously on 0800 555 111. In an emergency, always dial 999.